No harm done, because the prank only lasted a minute and Julie has a good sense of humour. But where is the line drawn when it comes to practical jokes? Or humour itself for that matter? When the Austereo DJs rang the London hospital pretending to be royalty and were put through to Kate’s ward it seemed like a harmless prank and in many ways it was. Prince Charles even joked about it afterward. The subsequent tragedy however has turned a handful of complaints against the radio station into a full-blown witch hunt. Death is no laughing matter. The reality is that humour and danger are intertwined, which is why comedy in all its forms is so entertaining. The greater the risk the greater the prestige. If a joke succeeds then it brings applause, fame and fan mail. If a joke fails then it brings boos, infamy and hate mail. There is a lot at stake. Sage advice for anybody in the highwire act of political cartooning where a single slip can land both you and your editor in court for defamation. Interesting that the only real legal defence for a cartoon is ‘satire’. It’s the precarious ‘get out of jail’ card that’s been employed with varying degrees of success whenever Aussie cartoonists have found themselves in front of a judge. In order to play the comedy game well you have to know your audience. That doesn’t just mean knowing how to find their funny bone, it also means knowing their limits. You can’t dance on a precipice if you don’t know where the edge is. An American comedian famously misjudged his audience by making a 9/11 joke. Even though it was several years after the tragedy he was loudly booed by the New York crowd thus proving it was still ‘too soon’. In the newspaper world this audience limitation is referred to as ‘taste’. Editors strive to make their presentation of news as entertaining as possible while not exceding the boundaries of their readership. If something goes too far then it is regarded as ‘tasteless’. Experienced journalists have a precise understanding of the power of the written word and each day they ‘swim between the flags’ of what can be said and not said. Cartoons on the other hand are a challenge because visual humour is hard to measure. A picture can say a thousand words or a thousand opinions, such is their ambiguity. It’s my job to push the boundaries of social commentary, so I rely on editors to make the final call, based on the constantly shifting sand of public opinion. While I don’t always handle the umpire’s decision well, in the end I prefer their judgement than the judgement of a court – or the acrimony of a society after triggering a human tragedy. This entry was posted in Editorial Cartoons, Life as a cartoonist and tagged Austereo, humour, Kate Middleton, nurse, phone, phone call, prank, prank call, pranking, Royalty on December 10, 2012 by Art by Peter Lewis. On November 16th and 17th 2012 the Australian Cartoonist Association had its annual Stanley Awards get together, this time in my home town of Newcastle. 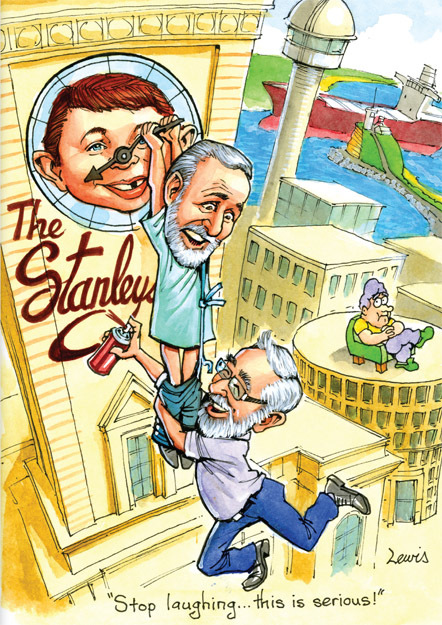 I was asked to provide the colour cover for the brochure and I portrayed Sam Viviano, art director for Mad magazine, and Alex Stitt of ‘Life, be in it’ fame. We had an exhibition of cartoons on the Friday night followed by the dinner and award presentation on the Saturday night. 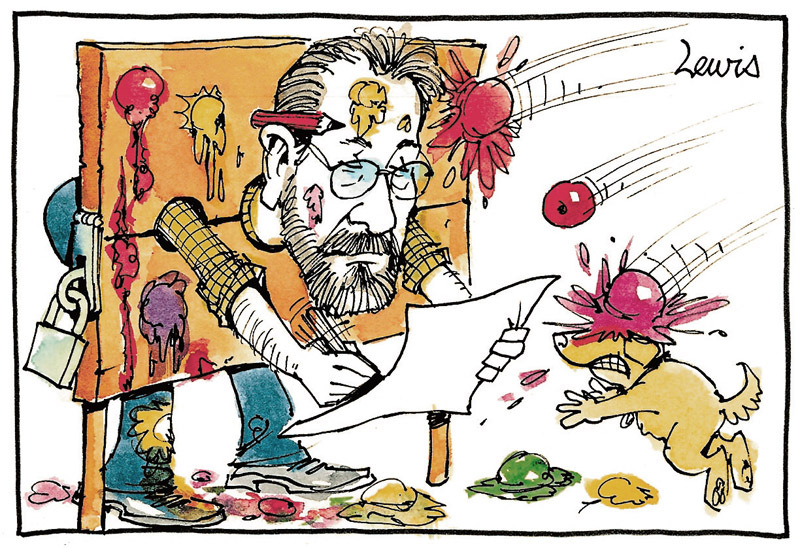 This entry was posted in Commercial Design, Life as a cartoonist and tagged ACA, australia, Australian Cartoonists Association, awards, cartoon, cartoonists, drawing, exhibition, sketches, Stanleys on December 2, 2012 by Art by Peter Lewis. 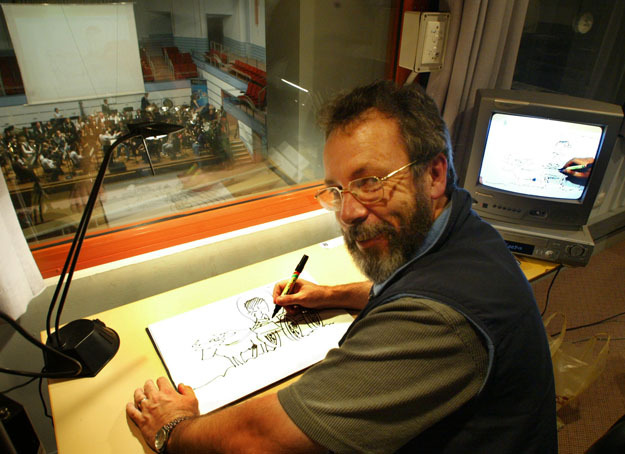 In 2005 the Newcastle Conservatorium had two public concerts with students playing Mussorgsky’s “Pictures at an Exhibition” which was originally written as a musical tribute to the work of artist Victor Hartmann. I painted a series of artworks as the music was being played and this was projected onto a large screen over the orchestra. The public response was positive even though I lost my place several times, and my artistic interpretations were probably very different to Hartmann’s original works. This entry was posted in Life as a cartoonist and tagged art, conservatorium, hartmann, music students, mussorgsky, Newcastle conservatorium, pictures at an exhibition on December 2, 2012 by Art by Peter Lewis. I used to wonder what I’d say if I ever met the Prime Minister. Well, now I know. 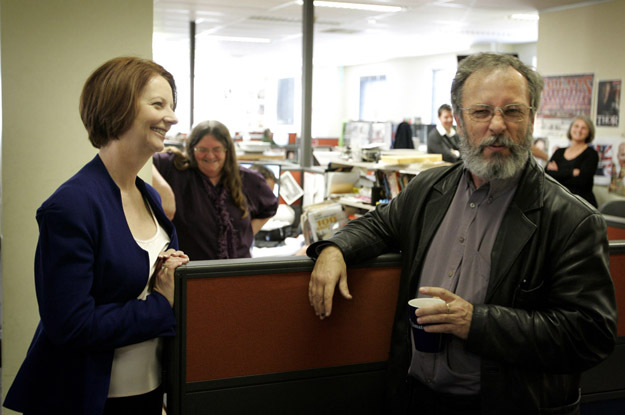 One quiet day in August I arrived at the Newcastle Herald, made myself a cup of coffee, walked out into the newsroom and there right in my path was Julia Gillard. 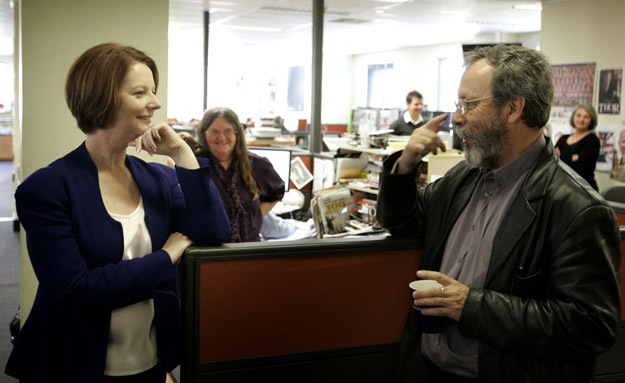 Before my brain had a chance to turn on I was introduced as the newspaper’s cartoonist and the PM’s gaze fixed upon me – along with most of the newsroom and her security entourage. She began with a comment about the way cartoonists draw her nose. At this point I should have swigged down the coffee, mumbled some pleasantries and moved away, but instead I discussed her pointy shnozz and then gushed that she was my favourite cartoon subject. Now, I could have said this about a male PM but not a female one. The newsroom erupted with embarrassed laughter and I was on the back foot for the rest of the conversation. 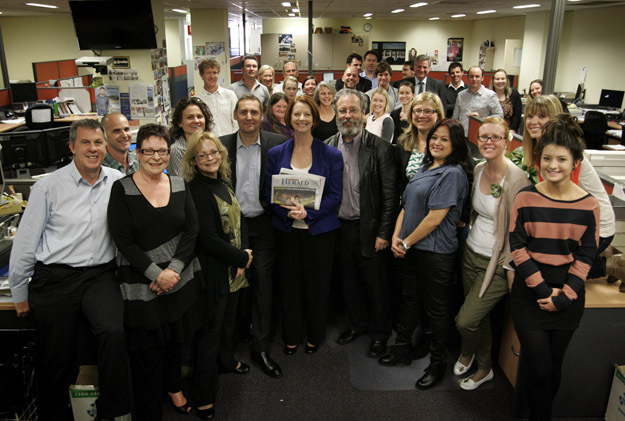 To her credit the PM seemed amused by the whole thing and posed shortly after for a group shot. This entry was posted in Life as a cartoonist and tagged australia, cartoonist, cartoons, celebrities, Gillard, Julia, Julia Gillard, politician, politics, Prime Minister on November 28, 2012 by Art by Peter Lewis.